Plant stand height is 14", width is 12", interior diameter is 9 1/2", it is best fit 9'' pot, the planter diameter larger than 9 1/2" can't use with this wood stand. Easy To Put Together and Take Apart : Simply stand it up and insert the cross bar in the notch, then twist the screw into the hole of the wooden planter, and tighten it up. It is also easy to take apart so you can bring it inside during cold winters or if you want to move it to a different spot. We purposefully made a product that would be easy to put together. TimeYard has come to be known as a trusted brand that behind 100% of its products, attention to detail is always our priority and each of our pieces is made with meditative focus, joy in the creative process, and gratitude. If you are completely not satisfied with your product, please return them for a full refund. We welcome all product questions with customer support available 24/7. 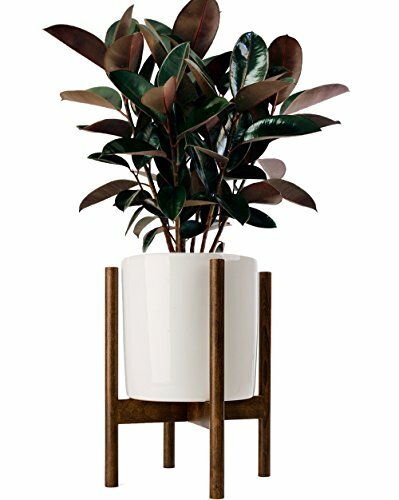 This sleek handmade wood plant stand is best fit 9'' pot, larger than 9 1/2-inch diameter can't be use with this item. It's perfect to display your favorite fiddle leaf fig tree, indoor burgundy rubber tree plant, large statement cactus, monstera deliciosa or snake plant together with heavy cylinder ceramic planter, rustic cement planter pot or modern brass planter. Material: this potted plant stand is meticulously handcrafted from dark walnut stained beech hardwood and made using dowel construction methods for strength and durability. Featuring the straight round wooden legs and neat angular design characteristic of the era, the base is a handsome addition to your home decor. This elegant house floor planter stand embraces multiple interior trends, with Scandinavian, minimalist, and geometric influences showcased alongside classic mid-century aesthetic. Drawing on nostalgic influences, this design is highly contemporary but truly timeless. They are very versatile and match well with your furniture and add a special condition to your living room, bedroom, balcony, kitchen dining room, apartment, office, etc. Keep this item for yourself or unique housewarming gift. Size: decorative indoor plant stand height is 14", width is 12", interior diameter is 9 1/2". The white round cylinder flower pot shown in the picture 1 is 9 1/2" diameter, 9 3/4" in height. This floor planter stand is perfect to place next to furniture or in a corner living room. These stands provide plantlife with better air quality, helps reduce pollutants and improves humidity levels in the air. Installation: Wooden house plant stand comes apart to lay flat in box for shipping. Simply stand it up and insert the cross bar in the notch, then twist the screw into the hole of the wooden planter, and tighten it up. This item only for the floor plant stand, not included decorative flower pot or other props in the pictures!